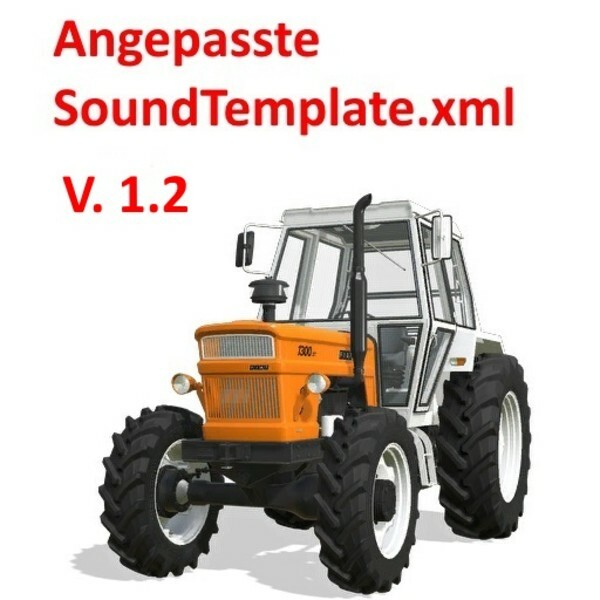 Since I did not like the full throttle sound in the new LS 19 and I had no desire to customize the Soundxml for all the Tractor I use in the game with my settings individually, I've messed around a bit at the soundTemplates.xml. The sound is regulated similarly as in the LS 17, so that the engine sound again increases depending on the speed when driving. It may not be perfect and may not fit all tractors equally well. But it is not so annoying anymore. Since I've been there before, I also equal the volume in the interior and the exterior adapted, which was a little too quiet. In the interior view of the tractor, you can hear the cultivator, plug or mower when digging. The damping in the cabin sound was also reduced slightly. There is an alternative soundTemplates.xml in the folder SoundTemplateForVCA_user . It has the original engine sound settings of LS19, but the rest is just like the other sound templates. It is specially designed for those who want to drive with the gearbox settings from the Mogli12 VehicleControlAddon. Or for those who are satisfied with the original engine sound settings and just want it a bit louder and more audible. This is a game changer for me. I had a volume turned down for most of game play time, because that annoying sound was driving me nuts, now i just hear engine sound, and that's more than enough for me. Thank you.